The e-zone touchscreen controls both the air management system as well as the air conditioning unit. With every room zoned independently, everyone can have their room at the temperature that suits them. 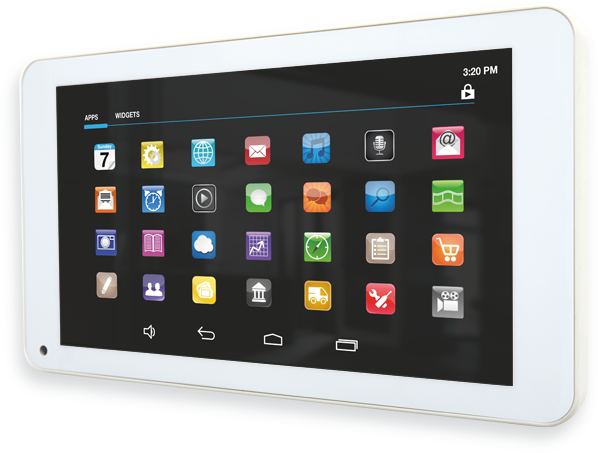 e-zone’s 7-inch colour touchscreen doubles as an Android tablet. Now you can manage your comfort and your connected home from one central hub. The e-zone screen is easy to read and simple to navigate. With the touch of a button, you can see which rooms are receiving air and how much, open and close zones, set schedules and turn the system on or off. As it’s fully integrated with all major brands of air-conditioning units you only need one control panel mounted on your wall. e-zone controls Daikin, Fujitsu, Panasonic, Samsung and more, go to our compatibility page for more. e-zone’s touchscreen controls both the air-conditioning unit and air management system, so there’s no need for 2 control panels. With e-zone you also control how much air each room receives, thanks to Advantage Air’s patented Exact Air Regulator (EAR). It uses advanced technology, usually reserved for commercial high rise buildings, that enables you to adjust the airflow to any room in 5% increments. As the air goes where it is needed you achieve your preferred temperature as energy efficiently as possible. For greater temperature control in the warmer or cooler rooms in your house install an Advantage Air Individual Temperature Control (ITC) sensor and the system will automatically adjust the airflow to maintain your selected temperature. Sensors are useful in those rooms that face the afternoon sun and upstairs rooms that heat up faster than the rest of the house. As ITC sensors ensure you won’t be over air-conditioning rooms, they have the added bonus of saving energy.